Proxy Preview, the report hailed by the Chicago Tribune as the “Bible for socially progressive foundations, religious groups, pension funds, and tax-exempt organizations”, is our annual publication covering the social and environmental shareholder resolutions filed each proxy season. 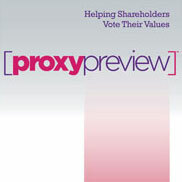 Proxy Preview provides analysis and expert insight to help you navigate the issues and successfully vote your shares. Proxy Preview 2017 is the 13th annual edition of the insider’s guide to social and environmental shareholder proposals. Proxy Preview provides the most comprehensive data on more than 300 resolutions—including corporate political spending, climate change, energy, human rights, diversity, sustainability, and much more. More than 30 guest authors provide analysis and expert insight to help you navigate the issues and successfully vote your shares. To download old copies of Proxy Preview, search our report archive. As the proxy season develops, Proxy Preview will be offering updates on some of the biggest companies that have received social or environmental shareholder proposals in 2017. Stay tuned to #ProxyPreview on Twitter for advance reminders of company annual meeting dates. Read our blog for detailed wrap-ups of the proposals filed at the company. If you own shares in a company, you have a voice. Shareholder advocacy leverages the power of stock ownership to promote social change. In the past 30 years, thousands of resolutions filed with companies by shareholder advocates have broken new ground in fostering more progressive corporate policies. And with over 400 resolutions filed this year, shareholder activism has never been more popular. As the proxy season develops, Proxy Preview will be sending out updates on some of the biggest companies that have received social or environmental shareholder proposals this year. Stay tuned to #ProxyPreview on Twitter for advance reminders of company annual meeting dates. Read our blog for detailed wrap-ups of the proposals filed at the company. Download Proxy Preview and use our resources to learn how to vote your proxy and make sure your voice is heard. hareholder activism isn’t just for pension funds and billionaires. If you own shares, it’s simple to vote your proxy via mail, internet, or phone. You can vote on the issues you care about. Proxy Season Updates will make sure you get the chance to have the companies you own hear your voice. Learn more at www.proxypreview.org.